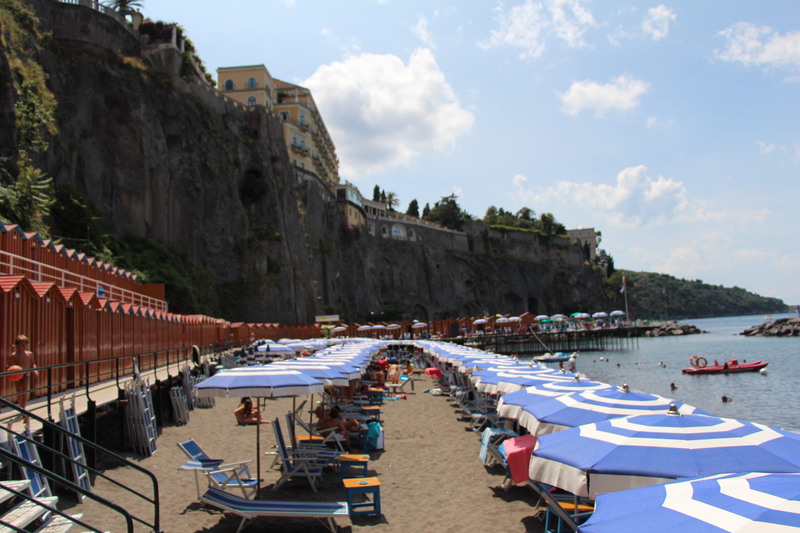 The Amalfi Coast had long been on my “must see” list, with its cliffside towns and crystalline blue Mediterranean seas, but eleven days there was just too much. I know I don’t love the place. Don’t get me wrong, it’s gorgeous. 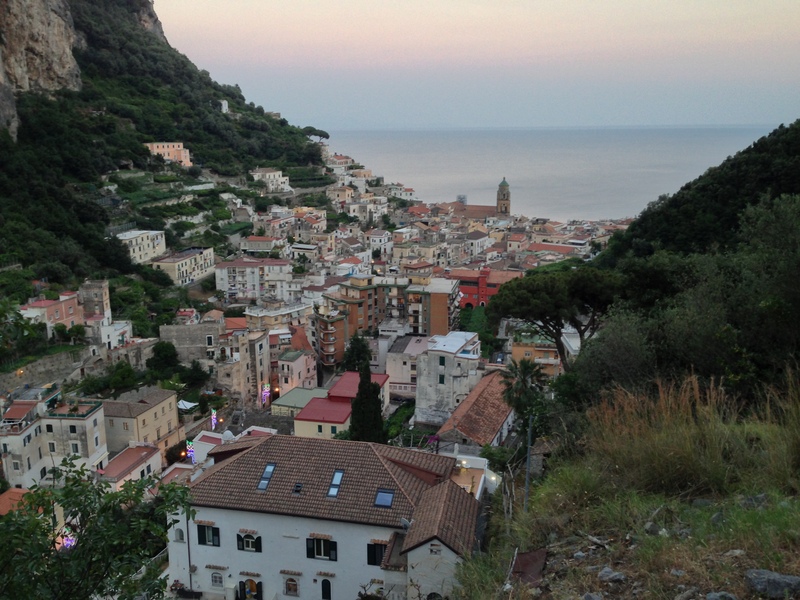 Colorful villages are improbably propped up on the literal edge of cliffs, hundreds of feet above the sea (see “Problem list below”). 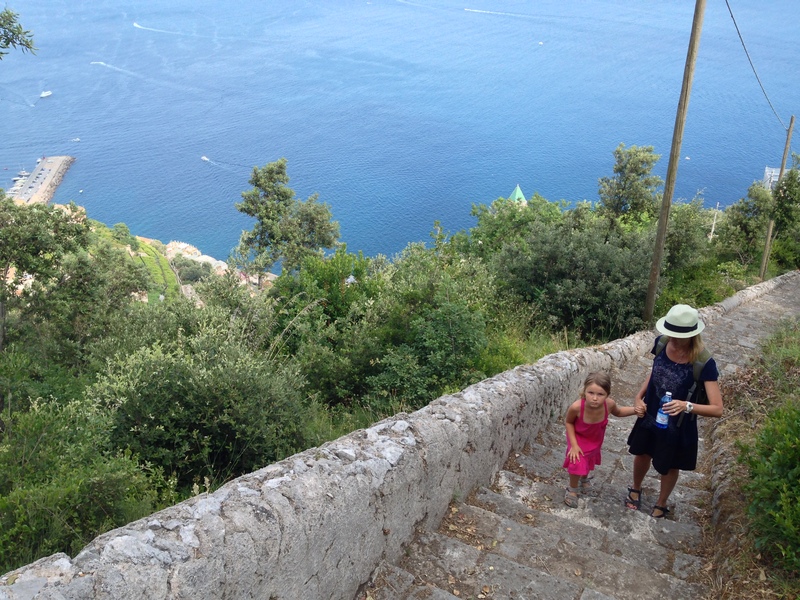 Stone staircases weave up across the lemon-tree filled hillsides, as many of the villages have extremely limited car access. Numerous beaches dot the coastline (although we didn’t spot any sand ones). The sea really does sparkle and luxury yachts cruise the coastline. The sun shines brightly and strongly (although we did have same rain–in July!). Problem #1: We drove. 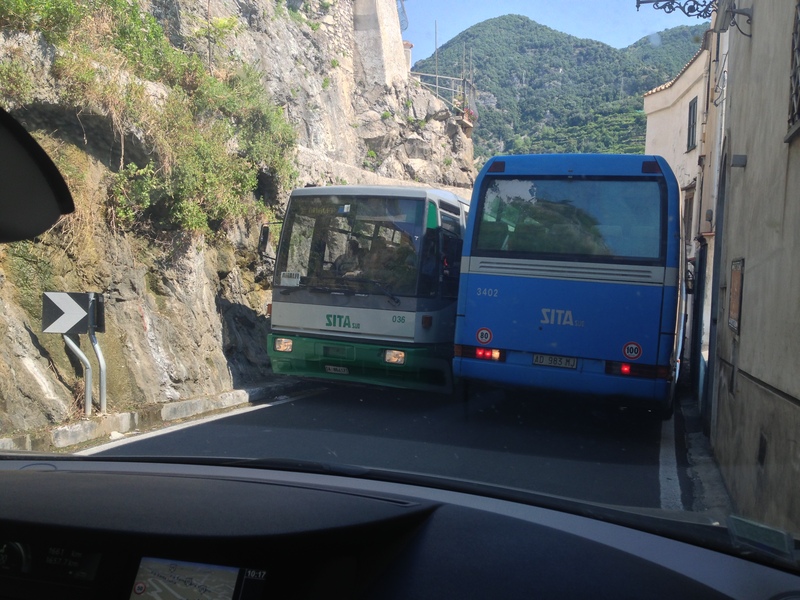 Driving the Amalfi Coast is not for the faint-hearted (or, arguably, the sane). Especially at the height of the tourist season where you compete with massive tour buses, local buses driving at breakneck speed, hordes of Mercedes minivans (also loaded with tourists), other hapless tourist drivers and pedestrians, and local drivers (many on mopeds) who seem to have a tenuous regard for their own longevity, all on narrow (and I mean one car width narrow), windy roads that hug the cliff. 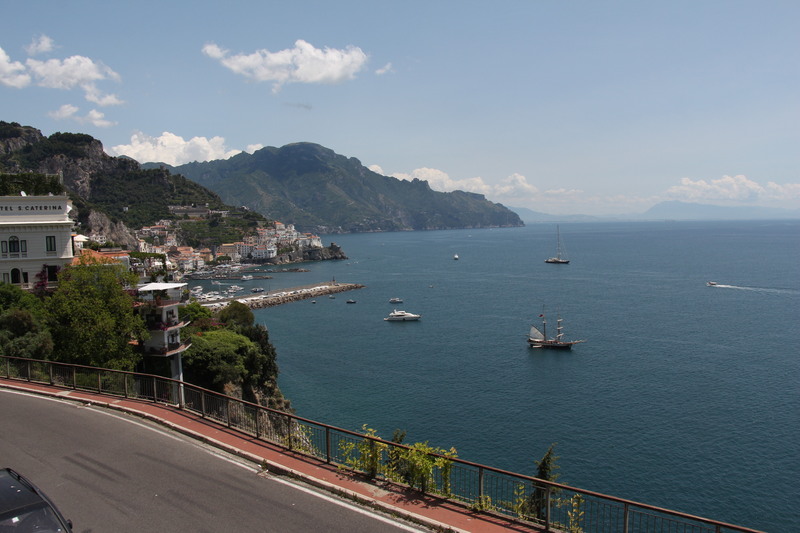 Suffice to say, the first few days my nerves were shot from the drive there and a subsequent day outing drive to Sorrento. My hands sprouted callouses from my tight grip on the steering wheel. After a couple of days, we realized that this was a coastline best explored by boat. Problem #2: As I mentioned, houses are improbably propped up on the literal edges of cliffs. The cliffs are limestone and the building sites seem to have stood the test of time, but my incipient Acrophobia was in overdrive. Even copious amounts of Chianti couldn’t relax me. 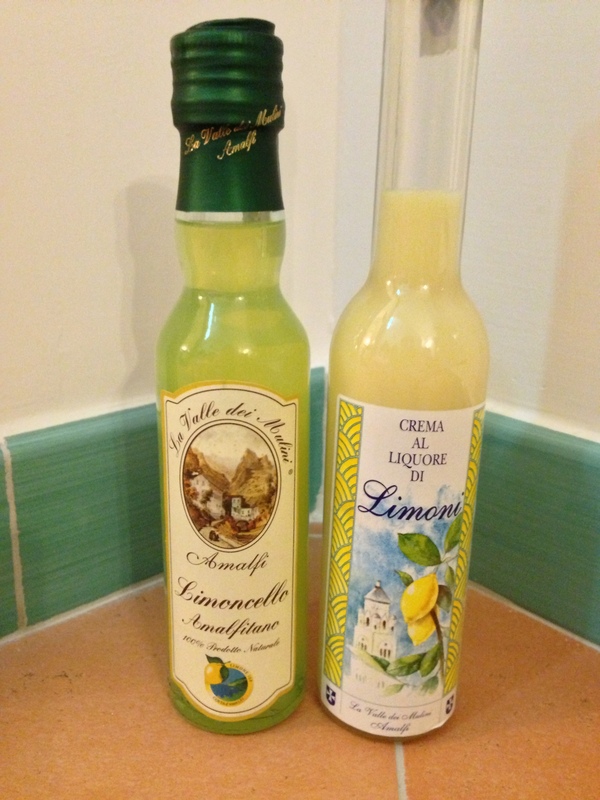 Thus, I had to resort to the local treat, Limoncello (the liquor, not the gelato). Problem #3: We like to walk. On the plus side, we could walk to town within 20 minutes. The big minus was that half of that walk involved braving the main road as a pedestrian. The only other place we could walk was up, which we did a couple of times, but it proved to be primarily an aerobic workout rather than a relaxing stroll. Problem #4: We love Italian food. However, we don’t love ONLY Italian food, and we’ve learned that we can reach our Italian food limit rather quickly. There just aren’t ANY other options in this area. But enough of the complaining. There was a lot we thoroughly enjoyed. 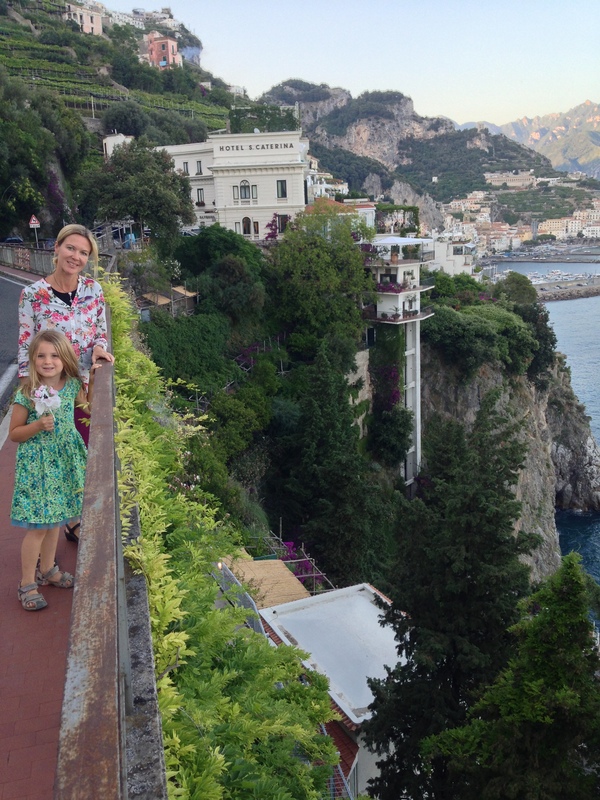 We stayed in a unique 1-bedroom “villa” on the famed 163 road connecting all of the towns on the Amalfi Coast. 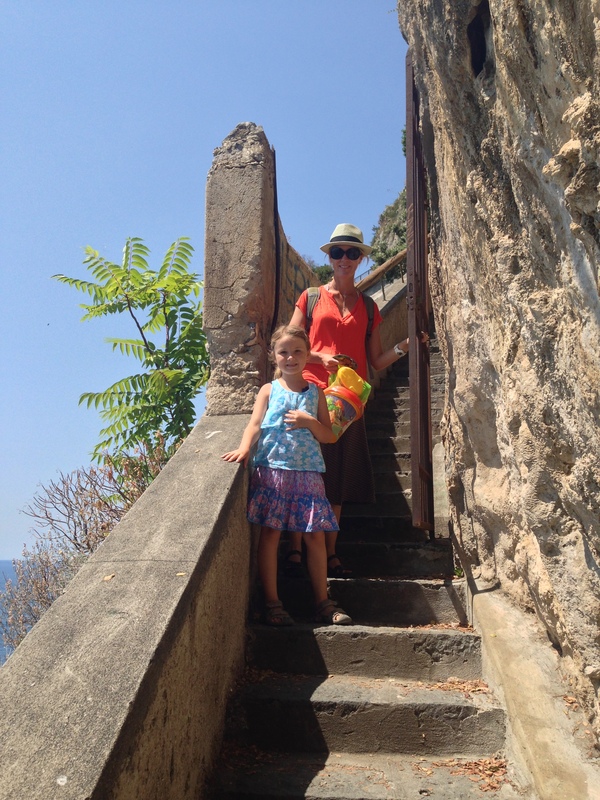 The owners were a truly generous couple who went above and beyond in making us feel at home, showering Zara with gifts, us with food and wine and not allowing their limited English to get in the way of sharing their enthusiasm for Amalfi with us. 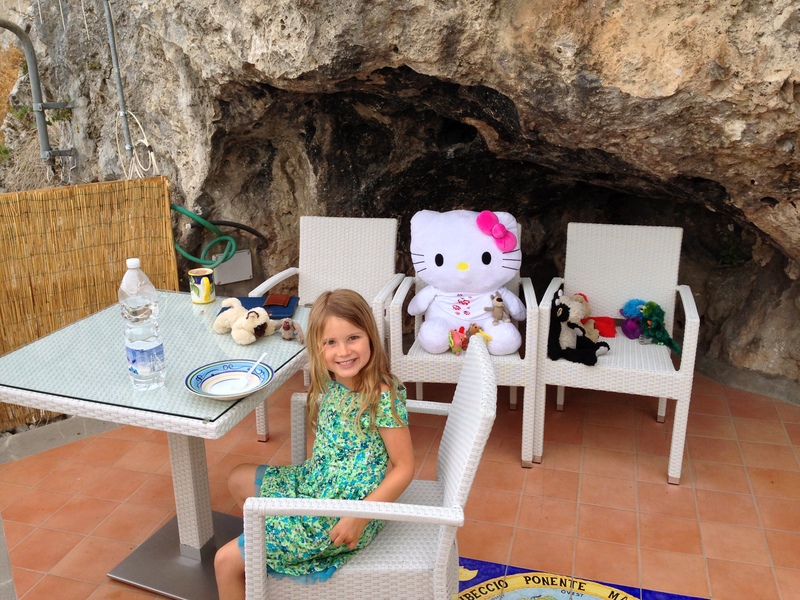 Every morning we breakfasted out on the patio which offered a picture perfect view of Amalfi town. 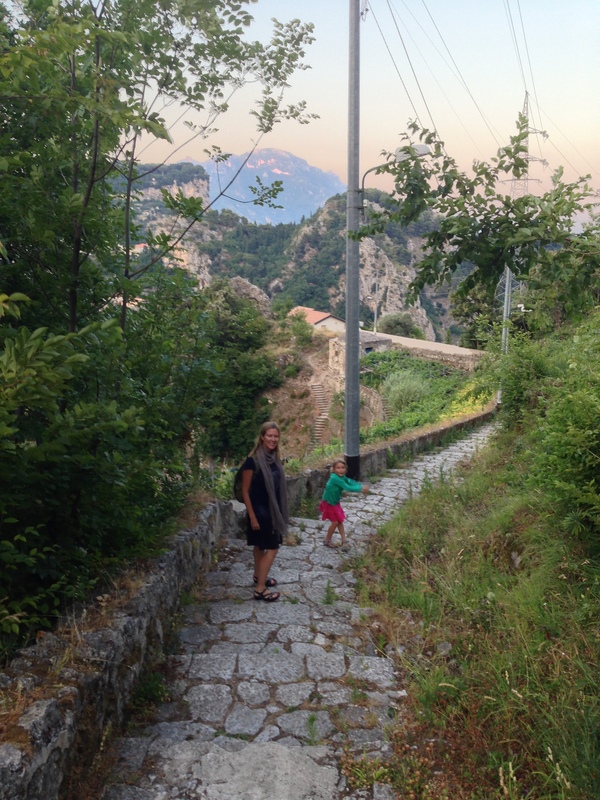 We took a wonderful walk up the hillside to the town of Pogerola, where we had drinks and dinner at the delightful Gerry’s Pub. 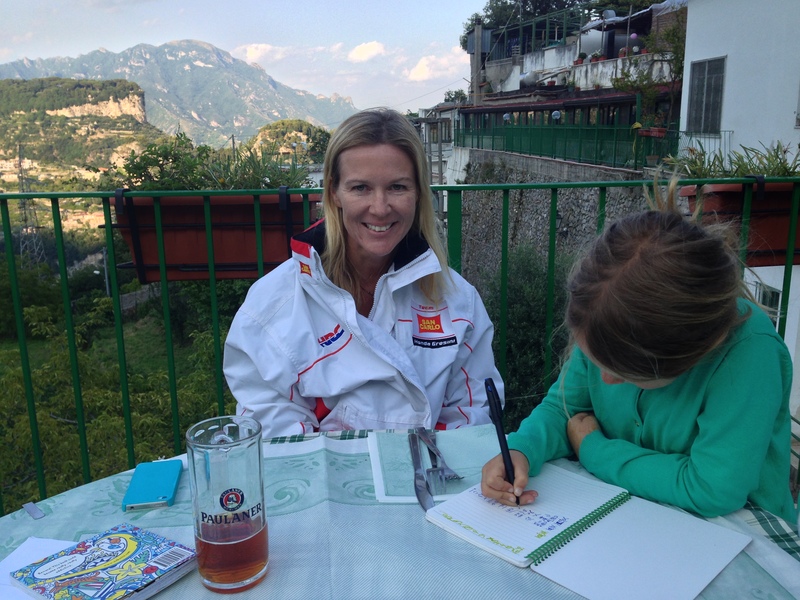 We sat outside on a patio with beautiful views of La Scala and Ravello and Gerry was so friendly he let me wear his cozy motorcycle jacket when the weather cooled. 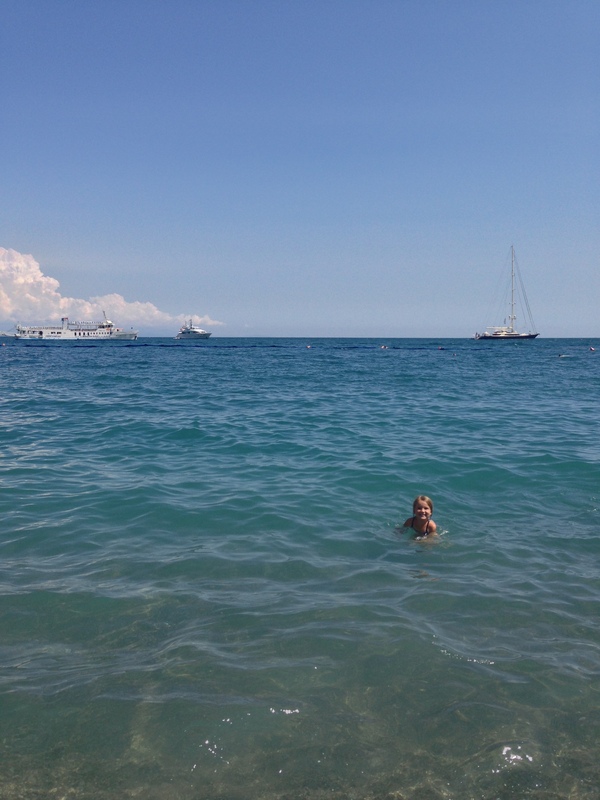 We swam in the Mediterranean several times. 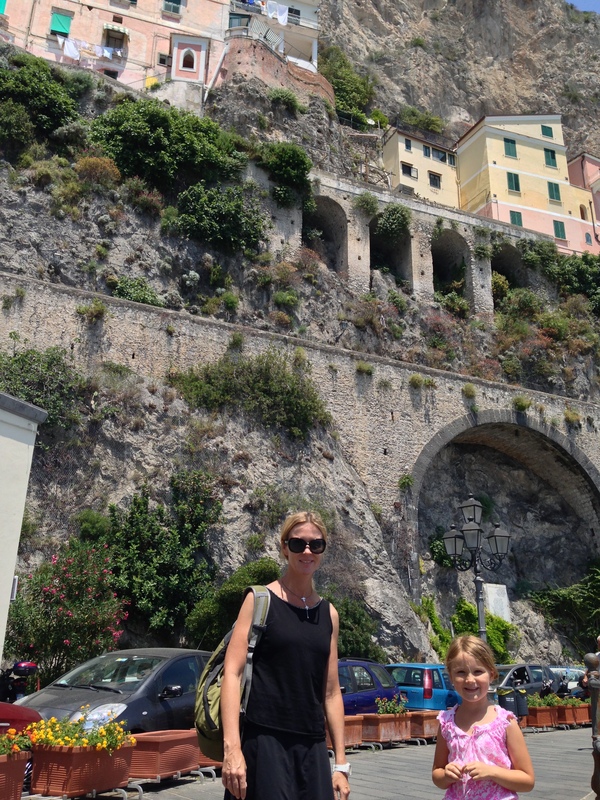 We took a ferry to the picturesque Portofino. 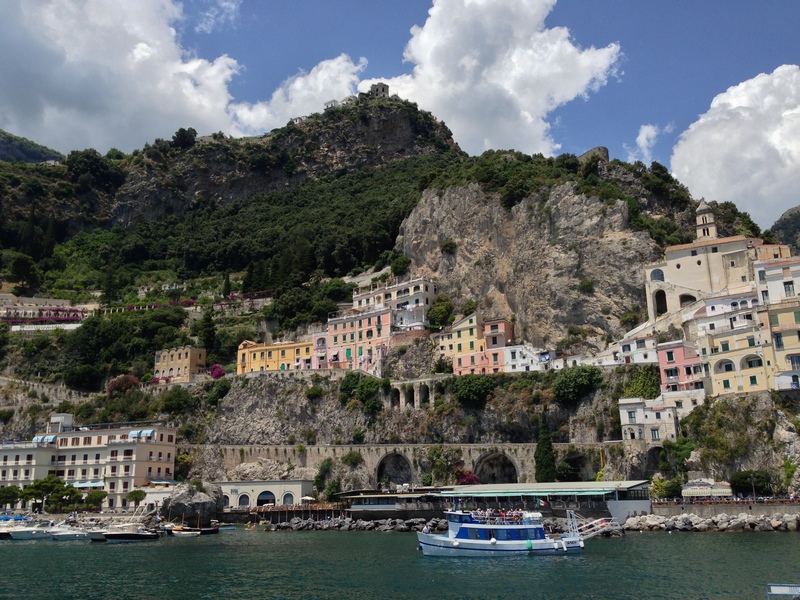 We also did a day trip to Capri (unfortunately, on a day that rained during the first half), took a boat to the Emerald Grotto and had an interesting day trip to Pompeii (separate post pending on that). Five or six days here would have been perfect. 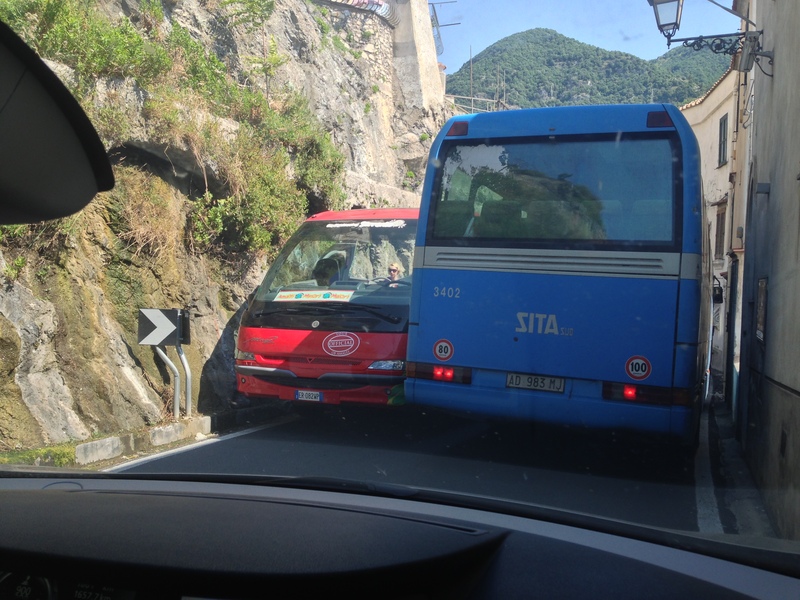 « Lake Como – That’s amore!